As all of you know, I quit my full time job as an engineering director 2 years ago. And with 40 extra hours per week of free time on my hands, I’ve been searching for a long time for another project to pursue that would keep me happy. In this episode, I’m going to formally announce my new business with my partner Toni Anderson! You’re listening to the My Wife Quit Her Job podcast, the place where I bring on successful bootstrapped business owners and dig deep into what strategies they use to grow their businesses. And today on this podcast episode, I’m actually announcing a brand new project that I’ve been working on that is finally ready for public consumption. It’s a business idea that will help you build your email list and your social following for your e-commerce store. And it’s actually a free service that leverages collaboration and influencer marketing. That’s right, it is completely free. But before we begin with the details, I want to give a quick shout out to Privy who is a sponsor of the show. Privy is the tool that I use to build my email list for both my blog and my online store. Now, there are a bunch of companies that will manage your email capture forms, but I like Privy because they specialize in e-commerce stores. And right now I’m using Privy to display a cool wheel of fortune pop-up. Basically a user gives their email for a chance to win valuable prizes in our store. And customers love the gamification aspect of this, and when I implemented this form email sign ups increased by 131%. Now bottom line, Privy allows me to turn visitors into email subscribers, which I then feed to my email provider to close the sale. So head on over to Privy.com/Steve, and try it for free. And if you decide you need some of the more advanced features, use coupon code MWQHJ For 15% off. Once again that’s P-R-I-V-Y.com/Steve. Klaviyo can track every single customer who has shopped in your store and exactly what they bought. So let’s say I want to send an email to everyone who purchased a red handkerchief in the last week, easy. Let’s say I want to set up a special auto-responder sequence to my customers depending on what they purchased, piece of cake, and there is full revenue tracking on every single email. Klaviyo is the most powerful email platform that I’ve ever used and you can try them for free at mywifequitherjob.com/K-L-A-V-I-Y-O. Once again that’s mywifequitherjob.com/K-L-A-V-I-Y-O, now on to the show. Steve: Welcome to the My Wife Quit Her Job Podcast. Today we’re doing another special episode that’s going to be different from the norm. Now as all of you know, I quit my full time job as an engineering director two years ago, and with 40 extra hours per week of free time on my hands I’ve been searching for a long time for another project to pursue that would keep me happy. And man in the past couple years I’ve gone through a bunch of different business ideas that never panned out. I had two software business ideas that really never made it past the validation phase. I had an influencer marketing business idea that kind of never made it past the testing phase either. Now, I guess the good thing about all these ideas is that I didn’t end up wasting any time and money on these projects, because I basically called it quits before a large amount of time and money was spent. Anyways, there are a few things actually, that I discovered about myself during this phase in my life and trying these businesses, that never panned out. And when I quit my technical job in 2016, I remember I immediately wanted to replace that job with a technical hardware based startup company. After all, I had been an engineer for 17 years; I wasn’t ready to give up the technical part of my brain. And so I kind of desperately went in search of a software SaaS based business that I could pursue. But I remember while I was starting working on prototypes for these software projects, I kind of quickly realized that the amount of upfront investment and more importantly the time commitment to get a SaaS based business off of its feet was pretty significant. And in order to commit to a large software project, I’d have to devote many more hours per week than even my day job, I would say. And in the end, I remembered why I started my businesses in the first place to spend more time with friends and family. Also, the other thing that I learned was that it didn’t really matter what type of business that I decided to pursue, whether it be software or hardware or something else, but more that I enjoyed who I was working with because life is too short to not be working with people that you like. Today I’m going to be talking about a project that I’ve been developing silently in the background with my business partner, Toni Anderson. Toni is also my partner for the Sellers Summit, which is my annual e-commerce conference and we worked really well together. I mean, at least from my perspective, I really have no idea how she feels about it, but it just felt right to start another business with her. So what is this mystery business? Let’s start by saying hi to Toni first, Toni, how you doing today? Toni: I’m doing great. Thanks for having me on again. Steve: So I mentioned at least from my perspective, I think we work well. I assume you feel the same way? Toni: I do. I think we have a good balance in personalities and also just the way we work. I think it really complements each other. Steve: So our new business is called Gobrandwin.com, and Toni do you want to kind of do some of the onus about explaining it? Toni: Sure. And can I give a little background on why I want to be a part of this because it’s something that to me is very important for my own e-commerce business? Toni: So one of the things that and I think like a lot of you, I’ve been a part of Steve’s course. I’ve been in e-commerce world for several years now. And one of the hardest things that I have found is building my customers off Amazon and getting them to buy from my own store. And while I love Amazon, and I love the revenue and the amount of traffic that I get, I realized that those are Amazon customers and not my own. And so for me trying to find a way to get inexpensive customers to the site has been a huge challenge. And one of the ways that I feel like has been very successful is through email marketing, but how do I get those people on my email list? And that problem that I have and I think most e-commerce people have has been something that we feel like Go Brand Win can really help with. And so to explain what we’re doing, Go Brand Win allows e-commerce sellers to partner with each other to host massive giveaways. Now I think most of us have probably run giveaways on our websites that have been $100, $200 and you get some entries but you’re basically marketing to your own audience. Well, what this does is allow us to collaborate with other sellers in basically parallel vertical. So not competitors but people who maybe you sell shoes and another person sells scarves, so your customers are fashion focused. It allows you to partner with those people and market to everybody’s audience and gain customers that way by hosting a massive giveaway in the likes of $1000, $2000, $3,000 but everyone is only contributing a couple hundred dollars in gift cards. And so that’s what Go Brand Win is going to do. We’re going to facilitate these giveaways for e-commerce sellers to help you build your email list, grow your audience, and gain new customers. Steve: Yeah, along those same lines, I actually recently published an article about how Chinese sellers are really taking over Amazon. And they have a lot of inherent advantages, especially on price. And in this day and age, in order to be successful in e-commerce, you really need to have a strong brand. And the only way to have a strong brand is to have a way to bring customers and visitors back to your site over and over and over again in order to gain mindshare for your business. 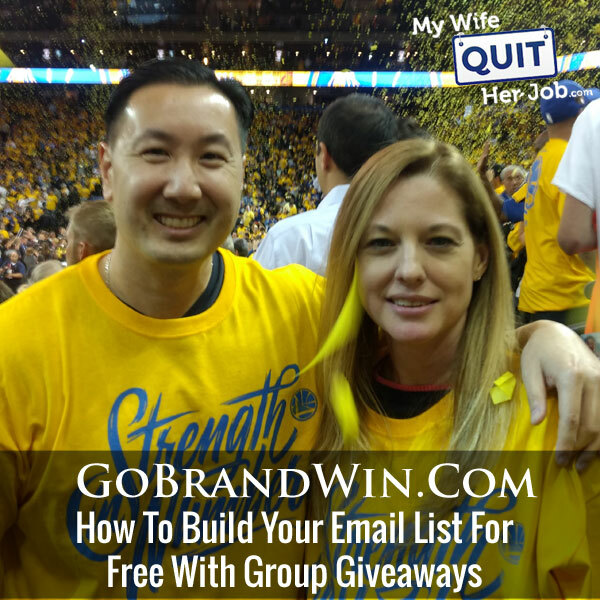 So you need to build an email list, you need to create a following. And that’s one of my motivations, at least for building Go Brand Win.com to help brands develop their email lists with group giveaways. And it’s a win-win situation. Everybody wins, everyone gets a list, and everyone gets in your customer base. Toni: And one of the challenges that I’ve had in the past is one, I’m only able to market to people who already know about me, or I’m using Facebook ads, which can be super expensive over time, especially if you’re not able to target the right demographic right away. Steve: Yeah, absolutely. And I’ve actually done this in the past on a smaller scale. I’ve partnered with other wedding companies where we would send out information about our own companies to each other’s lists. And so far, as far as I know, there haven’t been anyone who’s done this facilitation at scale. So here’s how it works. Let’s go into some of the details. If you want to participate, you contribute at least one gift card towards your products valued at $200 or more, and this is the prize for the sweepstakes, Go Brand Win will assemble gift cards from other participating brands with a similar customer base to be combined in one massive sweepstakes giveaway. Now, all the participating brands will send our co branded sweepstakes email to their list of followers and drive them to a sweepstakes landing page hosted on Go Brand Win.com. Now, all these entry forms will also be sent to related influencers in our blogger database. And right now we have almost 1,000 bloggers in various niches in our network and Toni has a huge Rolodex of bloggers as well. Now, consumers enter their email addresses in order to enter the giveaway. We send them special offers from your company, and then we select a grand prize winner. And after the sweepstakes are over, you will receive the full list of entrants and instantly grow your audience and your email list. Everyone wins. Now the requirements to enter is you must have your own branded shopping website, you must be willing to contribute a gift card of at least $200, and you must have an existing email list or social media audience. Toni: So I’ve done varieties of this over the past couple of years to build my email list on my shop. And I will say that I’ve had some massive successes and I’ve had some huge failures. And one of the things that I’ve learned from doing this is that the follow up sequence and the emails that I’m sending to these people after they enter is very, very important. Because one, you want to weed out the people that there are definitely going to be people that are just entering giveaways and they’re really not interested in your product. So you want to weed those people out fairly quickly. But then the people that are interested and the people that are potential customers, you want to work with them through your emails to get them eventually to buy from you. So in the past, I found that the better my email sequence is and the more authentic I am in my communication, and the more purposeful I am in what I do with these people, the more success that I have. And the last project that I did like this totally on my own, I ended up with about a 17% conversion rate for sales on these customers after about a six month period. So I feel that’s successful because it didn’t cost me anything to actually run this giveaway minus the gift card, the value of my cost of goods. Steve: Yeah, so I’ve actually run several giveaways myself, and I’ve compared notes with several colleagues. So one of my colleagues, Mike Jackness, he actually runs giveaways all the time. And he’s been getting incredible results. In one of his last giveaways, he got 6,000 email subs, paying only 14 cents per sub. And his overall cost of customer acquisition was only $3 and 47 cents, which is pretty crazy. I’ve run giveaways myself, not quite with the same results as Mike, but many of the contestants have become repeat customers on my list as well. And I also had a student in my class Abby who took part in a group giveaway relatively recently, and she received over 6,000 names, and of those 61 people purchased for a total return of over $3,000. And one thing that we’re going to do is we’re going to try to make this contest really viral. We’re going to use a tool called ViralSweep and here’s how it works. Once you enter in a contest, you’ll be given additional options to promote the contest by sharing on Facebook, by pinning on Pinterest, by sharing on Facebook Messenger in return for additional entries into the contest. And the fact that everyone has an incentive to share will generally make the contest go a lot more viral. So now if you haven’t run a giveaway or a contest in the past, if you’re just kind of brand new to the concept, you probably have a couple of concerns. So, one of the main concerns that most people have about giveaways and contests, are concerns about low quality email subscribers. One thing that we’re going to do is we’re going to have an autoresponder sequence in place. Once someone enters in, that will introduce you to all the brands and the sweepstakes along with some smaller gift card offers. And what that’s going to do, it’s going to introduce people to your brand along the way so that when they get emails from you, once we deliver the email subscriptions over to you, they’re not going to be surprised at receiving emails from your brand. Toni: In addition to that, we’re going to provide all of our e-commerce sellers with basically a cheat sheet that helps you learn tips and tricks that we’ve learned over the years of doing this to obtaining those customers, keeping them on your list, taking them from cold to warm leads. So we’re going to give you resources so that you can do a better job of keeping those customers and encouraging them to make a purchase. Steve: And bottom line this service is free. So if you think about it this way, a $200 gift card probably cost you maybe $50. And if you get a few thousand email subs out of it, that’s like 2.5 cents per email, which is ridiculously cheap. Toni: Okay, so if it’s free, what’s in it for us, Steve? Steve: So one thing for us, I run a blog. I also run a training class and I run a conference with Toni, and I want this as a value add for the students in my class and for those who attend the conference. I will also use these lists to promote my own e-commerce brand. I’ve run Bumblebee Linens for over a decade now. And I know these emails will be good for my store as well. And for me, at least, once we have critical mass, we may choose to monetize this list for larger brands. But for the foreseeable future, all these giveaways will be Free. What’s in it for you, Toni? Toni: I think like you, Steve. I also want to grow my own business. To me being introduced to other sellers in my same vertical where I can partner with them is very helpful. I’ve seen the power of this in my own shop; I went from a website that basically had no customers to a website that’s profitable basically by running these similar giveaways on my own. So the ability to do this with other people, I’ve seen the power of I’ve seen how it works. And I love the fact that it’s basically free, there’s very little risk. So that for me is really important. It also obviously helps us with Sellers Summit and the other e-commerce projects that we work on. Steve: I mean, we’re trying to make this a no brainer. And one of the other concerns that we think you guys might have is, what if I’m matched with other brands that have tiny email lists, like what’s in it for me? And what Toni and I are going to do is we’re going to spend a lot of time matching companies of the same size and reach together. And in addition, we’re going to also make sure that all the companies participating in a given sweepstakes all have a similar customer base. Toni: I think if you’ve attended Sellers Summit and you’ve been in part of our mastermind groups, you see that pairing up the right people is very important to us. And we’re going to put the same level of effort into this project as we have pairing up people in Sellers Summit and other projects we’ve done. Steve: And to be quite frank, I think we’re pretty good at it. Just based on running the conference, and the masterminds for the past couple of years, we have a pretty good handle on which customer base, and which brands will kind of go together. So the site is called GoBrandWin.com. And I just want to emphasize that everything is free for advertisers, go on the site, go on the advertise tab and go ahead and fill out the application. And if you have any questions at all, feel free to contact either me, or Toni at Toni@Gobrandwin.com or Steve@Gobrandwin.com. And that’s G-O-B-R-A-N-D-W-I-N.com. “And it’s actually a free service that leverages collaboration and influencer marketing. ” – it will be great if you could explain more about your influencer marketing service, can you?